Bread making is an art as well as a science, and may take a while until you get the kind of challah you want. It takes more time than most recipes on this site. Most of the time, you are waiting! The work itself is minimal. Makes 4 loaves. Recipe may be halved or doubled. 2 tablespoons instant yeast, or 50 grams fresh compressed yeast, or three envelopes. 35 oz. or 1 liter of water. You can use water from cooking potatoes to add extra texture, or other leftover cooking water. Some use part juice. Take into account any strong flavors. 9 cups flour for the sponge and another 4 to 6 cups for later. Use white, whole wheat, or a mixture. Instant yeast can be mixed right in, but fresh or compressed yeast needs to be “proofed” with a quarter cup of warm water (measure the full amount, then pour off the quarter cup) and a pinch of sugar. Stir all of the ingredients including 9 cups of the flour. The texture might be loose or sticky, it doesn’t matter as you will adjust the amount of flour later. Note down any changes you make. Cover well. Marcy Goldman’s trick is to place the whole bowl in a garbage bag. Let the sponge rise on the counter, or in the refrigerator overnight. The sponge is ready when it’s bubbly. On a hot and humid day the dough can be ready within an hour. On a cool day it will take up to two hours. Longer is fine too. Stir the batter and add about 4 cups of flour. You may need more, but I can’t give you an exact quantity. The dough should be cohesive yet quite sticky. You will need to be able to shape it, and after kneading it will get easier to handle. You can always add more flour later, or even water if it gets too dry. After letting the dough rest for 20-30 minutes (autolyze), I’ll knead for 10 strokes, let the dough rest for 15 minutes, and then repeat twice for a total of 3 sets of kneading and resting. Then, after another 15 or so minutes, I’ll do a few stretch and folds. Then I let the dough rise until doubled in volume, then do the same old shaping and second rise that kneaders do. After letting the dough rest for 20-30 minutes (autolyze), I’ll do a few stretch and folds, then let the dough rest 45 minutes, then repeat for a total of 3 stretch and fold then rest sessions. After the last rest after the final stretch and fold, I’ll shape it and let it do the regular second rise. After kneading or stretching, you can put it into the refrigerator or shape it right away. For a braid, make 1 long “snake” and 1 short one. Form the long snake into a U-shape. Add flour as necessary, but too much will make the dough heavy. Rest one end of the smaller snake in the center of the U. This will become the “nose.” Then bring strips from alternate sides into the center, to make a braid. Don’t worry too much as imperfections will be less visible as the dough rises. When you are done, tuck the ends underneath the loaf. You can also make one long snake and roll it into a spiral. Or roll out part of the dough with a rolling pin, spread with a thin layer of oil, sprinkle sugar, cinnamon and nuts, then roll it up into a cake. Brush with beaten egg and sprinkle sesame or poppy seeds on top. I like to bake braids into loaf pans, because moist dough spreads out in a flat pan. Bake at 180 C. or 350 F. The challah is done when the bottom is medium brown; when you tap it you should hear a hollow sound. Remove from pan and cool on a baking rack. It looks good and sounds like a lot of effort goes into making it. The kids bake challah every Friday at school. They use whole-wheat flour and they let the kids make any shape they want to. Titchadshi on the new look! The banner is gorgeous! Great header! 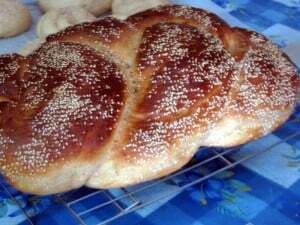 Interesting challah recipe. For after Pesach maybe; when I have more time for cooking on Friday afternoons. If you follow the stretch and fold way, there’s no kneading and the work is minimal. Time becomes a main ingredient, is all. Oh yes, and the new look is gorgeous! I made this Challah a couple months ago with mostly whole wheat. It tasted pretty yeasty to me, maybe because I left the dough in the fridge overnight. It was still the best Challah I’ve ever made. I frove a loaf and some rolls and warmed them in the oven a couple months later. Amazing! My dad also used this recipe and he and my mom said it was the best Challah any of us has ever made. I still thought it was a lot of work, but I think we should all make Challah once in a while, and this is one good recipe.